Are your steel pan instruments in need of tuning and maintenance? We can help to restore your instrument’s tuning, carry out minor repairs and advise you on keeping your steel pans in tip top condition. With regular tuning and maintenance new steel pan instruments can last up to twenty years. Contact us to discuss your requirements, receive an upfront quote, and to organise a suitable date and time for our specialists to visit your location. If you prefer we can collect your steel pans, stands and cases, and return them to you tuned, repaired and cleaned. Either way you receive a detailed report along with our expert recommendations. Most instruments require care, maintenance and regular tuning to maintain a good quality of sound. 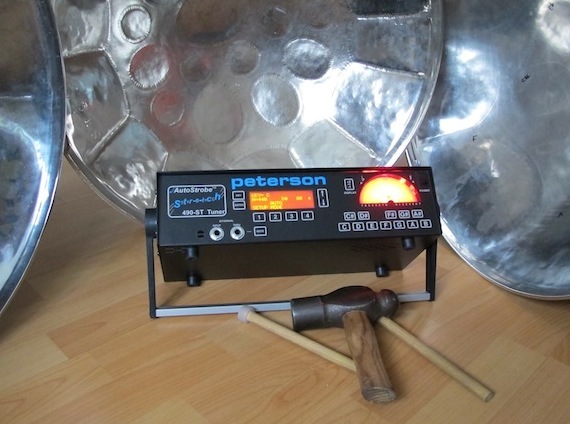 The steel pan instrument is no exception with the handful of UK based ‘pan tuners’ in great demand to maintain the ever increasing number of instruments as its popularity grows. Pan making and tuning is a craft that takes tuners years to perfect. Below is a summary of the process. Fifty-four gallon drums are used as the raw materials for all steel pan instruments. The drum is heated to a high temperature before the surface is hammered into a bowl. Ray Holman demonstrates and explains how steel pans are traditionally made. The notes are marked out using templates for the the type of pan being made. The area between the notes is hammered to cause the marked out areas to protrude. To isolate each note the area marked is grooved with a nail punch and hammer. 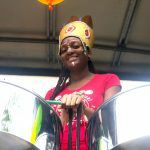 The unwanted parts of the drum skirt is cut away to the correct length for the type of steel pan being made. 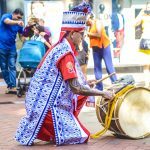 The drum is then heated to a high temperature and cooled quickly to temper the metal so the tuning holds for longer. Pete Seeger meets steel pan makers and players in Trinidad 1956. The pan is finely tuned producing accurately pitched notes. The pan is either chromed, powder coated or painted to give a pleasing finish to the instrument. 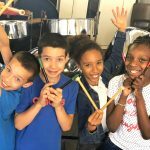 Tuners use a variety of tools to make and tune steel pans including hammers, electronic tuning machines and tuning forks.